Cotto finishes 41-6, and he looked his age far too often. He hurt his left arm in the seventh round in losing by scores of 115-113, 115-113, and 116-112. 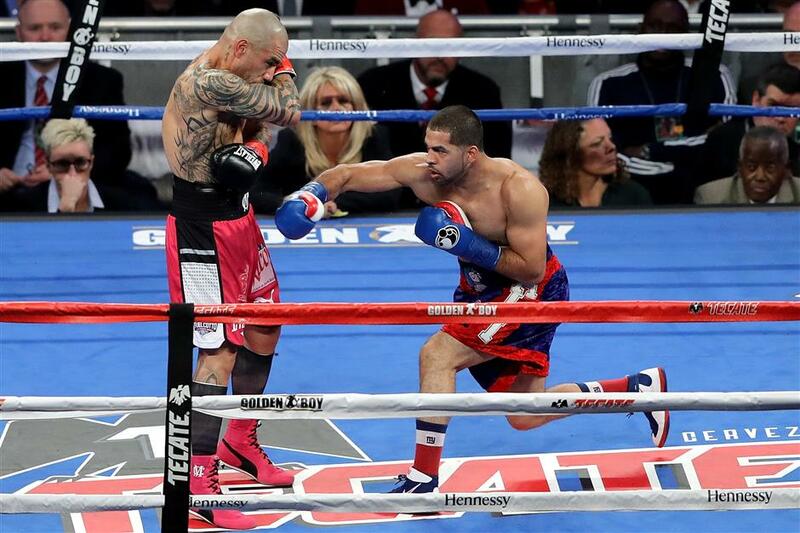 Puerto Rico's Miguel Cotto (left) dodges a punch from Sadam Ali of the United States during their WBO junior middleweight title fight at Madison Square Garden in New York City on December 2, 2017. This wasn't the way Miguel Cotto planned to leave boxing. Sadam Ali ruined the Garden party for Cotto on Saturday night, sending the Puerto Rican star into retirement with 12-round defeat by unanimous decision. It was a matchup of a Brooklynite and an adopted New Yorker, and it had the building rocking. 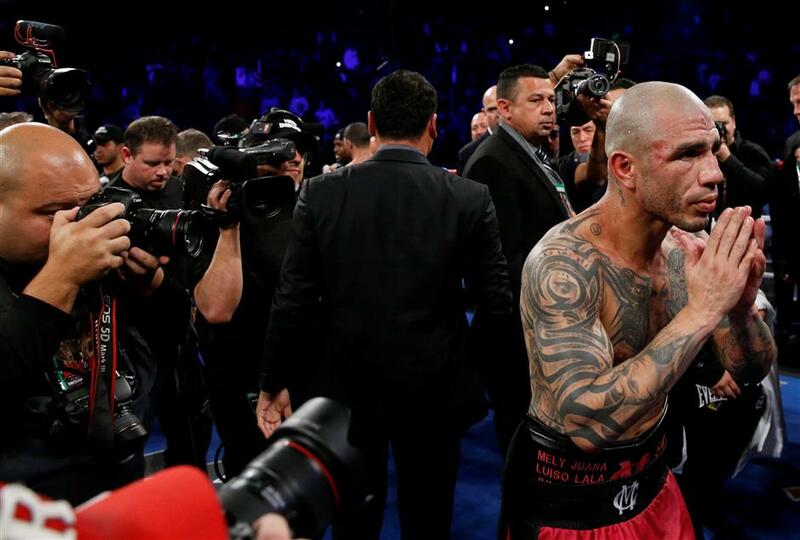 The 37-year-old Cotto simply couldn't handle the quickness of his younger opponent, who took the WBO junior middleweight belt. Ali did it despite being the less-popular fighter only miles from his borough; Cotto has made Madison Square Garden a second home, but fell to 8-2 in the arena. "I had him hurt here or there in the first couple of rounds," Ali said. "I knew I had to do something, or he would have dug in." "Feeling good with the performance," Cotto said. "Something happened to my left bicep ... I don't want to make excuses, Sadam won the fight. It is my last fight. I am good, and I want to be happy in my home with my family." Many of the 12,371 fans booed the decision and again when Ali spoke in the ring. "I worked hard for it," the 29-year-old Ali said. "I took advantage of this fight, and I made sure to make it count. I want to thank team Cotto, they could have taken an easier fight if they wanted to. " The fans soon were cheering as Cotto made his final statements to his legion of fans. "Thank you to everyone," Cotto said in English. He usually answers questions in Spanish. "Thank you for all the fans, I am proud to call MSG my second home. I had the opportunity to provide the best for my family because of the sport." Cotto had received a thunderous ovation when he entered the ring, and they were chanting his name as he left, proud but defeated. Ali is 26-1. He started quickly, then was stunned by a big right from Cotto that staggered him. Cotto charged as Ali recovered at the ropes, but it looked as if the fight had turned. It hadn't. Indeed, Ali won the final four rounds on all three judges' cards. Ali lost his previous title fight to Jessie Vargas in 2016 when he was stopped in the ninth round in a welterweight match. Now, he becomes a force in this division. His hand speed and movement around the ring made him formidable on Saturday night. "Good things happen to good people," Ali said. "I have been training since I was 8 years old, and I am glad I got this win at MSG, in my hometown." Cotto, meanwhile, leaves boxing with a legacy that can't be tarnished by this loss. Holder of six belts in four weight classes in his distinguished career — and the only boxer from the tradition-rich Caribbean island to own four such titles — he retires with a reputation as one of the classiest and fearless fighters of his era. Sure, he lost a handful of other bouts, but they were against such prime competition as Canelo Alvarez, Floyd Mayweather Jr, and Manny Pacquiao. One thing was certain for the paying customers: Cotto would deliver a good show. He did so in his farewell, too. Ali just as better. Miguel Cotto reacts after losing to Sadam Ali during their WBO junior middleweight fight at Madison Square Garden on December 2, 2017. On the HBO undercard, Rey Vargas outpointed Oscar Negrete in an awkward 12-round brawl in which the champion was left with a swollen and bloody face from head butts. Still, Vargas won the battle of unbeatens to hold onto his WBC super bantamweight title. Vargas easily won all the judges' scorecards, using a significant reach advantage for scores of 119-109, 119-109, and 120-108. The Mexican champion improved to 31-0, while Negrete, of Colombia, lost for the first time in 18 bouts. "It was really hard to find my rhythm," Vargas admitted. No wonder: Negrete's unorthodox rushes had Vargas missing time and again. But Vargas, 27, also landed dozens of body blows and rarely allowed the 30-year-old Negrete inside. Yet it was Vargas who looked the worse when they left the ring. "I have the humility to say that I made my share of mistakes," Vargas said, "but I feel that Negrete fought very dirty, and was not a very good boxer." Earlier, Angel Acosta dominated Juan Alejo before knocking him out in the 10th round for the WBO junior flyweight crown that Japan's Kosei Tanaka vacated on Friday. Acosta, 27, of Puerto Rico, is 17-1 — the only defeat was by decision to Tanaka in May — and all of his wins have been by knockout. Acosta had Alejo, 33, of Mexico, in trouble throughout the later rounds. He landed a sharp right-left combination to end the fight. "It's taken me five years to get here, and I'm cherishing this moment for me and for Puerto Rico," said Acosta. "I've learned a lot since my last fight for a world title against Tanaka, and this fight proves that I learned and fixed all I needed to win a world championship." Alejo is 25-5-1 and has lost in both his shots at a world title. He was beaten by Donnie Nietes for the WBO championship in October 2015.